Although many patients worldwide suffer from retinal degenerations, there are currently only very few treatment options available for blinding diseases like age related macular degeneration (AMD) or Retinitis Pigmentosa (RP). The diversity of the disease-inducing stimuli (endogenous and exogenous), the heterogeneity of the resulting phenotypes and the large variety of molecular response mechanisms in the retina makes it difficult to design successful therapies for patients. The main reason for this lack of effective therapies, however, may be the incomplete understanding of the molecular events leading to retinal cell death and hence to the impairment of vision. Thus, our work in the Lab for Retinal Cell Biology at the University Hospital in Zurich focuses on the elucidation of the biochemical events and molecular signaling cascades during retinal degenerations. The goal is to understand the pathways induced by the diverse stimuli in order to develop neuroprotective strategies which may ultimately lead to the rescue of vision in patients. Members of the JAK/STAT signaling system are induced in all cases of retinal degeneration analyzed so far. Leukemia inhibitory (LIF) factor is an extracellular ligand which is produced by a subset of Muller glia cells in response to photoreceptor stress. Upon binding to its receptor, LIF activates the JAK/STAT cascade in target cells. By doing so, LIF is an essential coordinator of an endogenous defense response in the retina. Lack of LIF dramatically accelerates disease process and photoreceptor degeneration (Samardzija et al., FASEB J, 2006, 20, 2411; Joly et al., J. Neurosci, 2008, 28, 13765). Thus, the molecular regulatory network in the retina not only relies on intracellular signaling pathways but also on extracellular components and cell-cell communications. Muller Glia cells may be a source for a number of additional survival and growth factors like fibroblast growth factor 2 (FGF2). Recent evidence suggests that production of FGF2 depends on the presence of LIF. 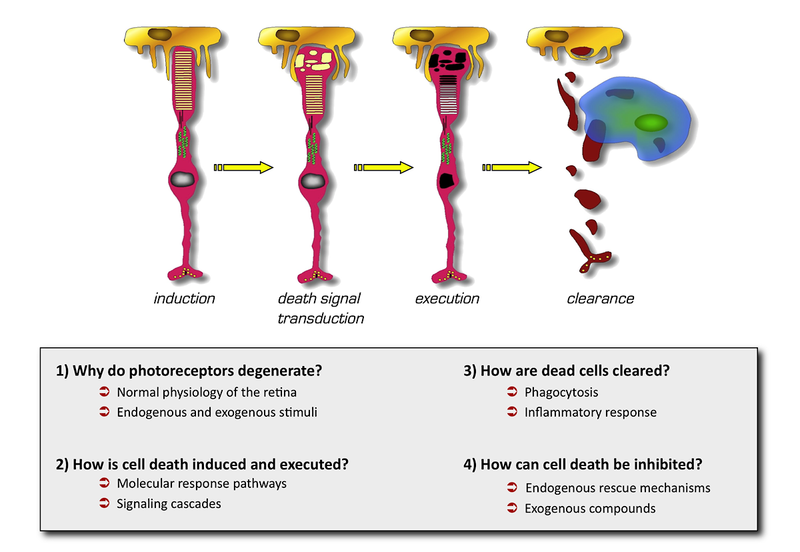 However, LIF may not act directly on Muller cells but may need photoreceptors as an intermediate cellular relay station for the induction of the Muller Glia response (Joly et al., J. Neurosci, 2008, 28, 13765). The complete understanding of this endogenous defense pathway still needs a major research effort but has a strong potential to be used as a target for the artificial induction of a powerful neuroprotective system. Photoreceptors need a large amount of oxygen to generate the energy needed to regulate their ion homeostasis for proper retinal function. It may thus be obvious that the retina expresses a regulatory system to sense oxygen concentrations and to react to differences in oxygen tension. Central to this system are the hypoxia inducible transcription factors (HIF’s), especially HIF-1. Recently we showed that a short hypoxic exposure stabilizes HIF-1a and HIF-2a in the retina leading to the expression of target genes like erythropoietin (Epo), vascular endothelial growth factor (VEGF), and others. Hypoxic exposure not only increases expression of these genes but also protects the retina against a subsequent toxic light insult suggesting that low oxygen concentrations activate neuroprotective factors in the retina (Grimm et al., Nature Med, 2002, 8, 718; Grimm et al., J. Neurosci, 2004, 24, 5651; Thiersch et al., Eur. J. Neurosci, 2009, 29, 2291). A major research project in our lab investigates the molecular mechanisms underlying this phenomenon of neuroprotection by hypoxic preconditioning. A detailed analysis of the hypoxic transcriptome of the retina has identified a large number of differentially regulated genes after hypoxic exposure. These genes may encode potential protective factors or may be involved in the regulation of the neuroprotective response (Thiersch et al., BMC Genomics, 2008, 9:73). A detailed investigation of the role of these genes may uncover mechanisms, which may render photoreceptors more resistant to toxic insults. On a separate line of investigations, special attention is given to the role of various regulatory proteins of the hypoxic response like the von Hippel-Lindau protein, HIF-1a, Epo and Epo receptor, small GTPases like Rac1 and Cdc42 as well as proteins of the cytoskeleton. We not only concentrate on the pathophysiological mechanisms in the retina but we also investigate the molecular network in the healthy retina. This knowledge is essential to provide the basis for the development of therapeutic strategies for the treatment or prevention of degenerative diseases of the retina. The specific questions in connection with the hypoxic retina are also directly relevant for the understanding of the retinal pathology in situations where neovascularization further complicates progression of retinal diseases. Many factors involved in angiogenesis or neovascularization are directly or indirectly regulated by the transcription factors of the HIF family of proteins. With our research, we not only want to contribute to the general understanding of the retina but we also hope to identify molecules, which may be targeted by neuroprotective treatments in order to reduce or inhibit progression of degenerative diseases of the retina.